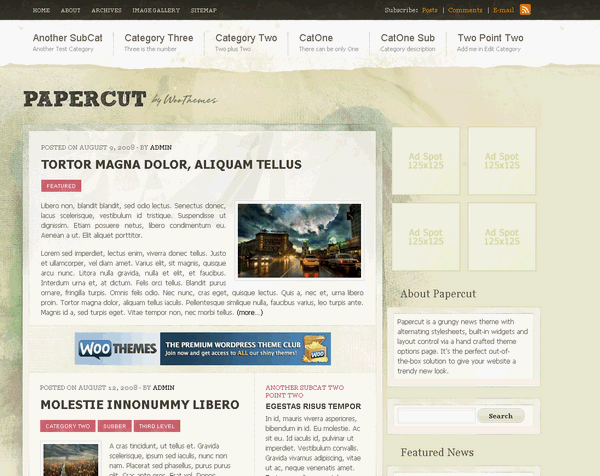 Papercut is a grungy news theme with beautiful alternating stylesheets, built-in widgets, and layout control via a hand crafted theme options page. It’s the perfect out-of-the-box solution to give your website a stylish new look. Irrespective of your preferred style; Papercut will have one you like. Five eye-catching theme styles to pick from that include the default, newspaper, red print, wood and floral prints. An unique homepage layout, with a beautiful grid structure that keeps your content looking fresh and appealing. Beautiful comment styling and unobtrusive advertising banner placements. A completely widgetized sidebar with custom widgets included in the theme packaging. No third party widgets required. Please note that the theme package includes all of these colour schemes and with the Theme Options backend, it is possible to change the theme’s colour scheme (between these) whenever you see fit.